NovaSure® endometrial ablation is a quick, safe, and simple procedure to lighten or stop your periods, without the side effects of hormones or the risks of hysterectomy. No pills. No hormonal side effects. 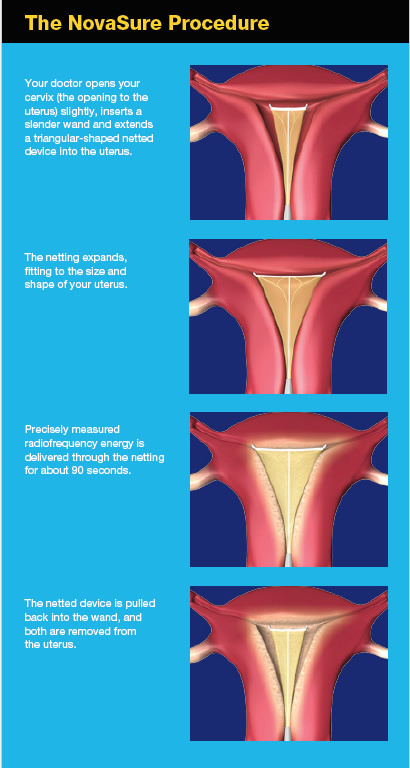 NovaSure® Endometrial Ablation is a one-time, 5-minute procedure that gently removes the lining of the uterus' the part that causes the bleeding. The NovaSure® procedure can reduce or stop bleeding altogether. It's a less invasive alternative to hysterectomy, and avoids the potential side effects of hormones. IS NOVASURE ENDOMETRIAL ABLATION PROCEDURE RIGHT FOR ME? Women with heavy or long-lasting periods who do not wish to have children in the future may be candidates for the NovaSure® procedure. Your doctor can decide if the NovaSure procedure is right for you. But if you're sure you don't want any children in the future, and your doctor rules out more serious causes of heavy bleeding, you may be a good candidate for the NovaSure® procedure. CAN I STILL BECOME PREGNANT AFTER THE NOVASURE ENDOMETRIAL ABLATION PROCEDURE? Because NovaSure® endometrial ablation treats the lining of the uterus, your chances of getting pregnant after the ablation procedure will be reduced. However, it is still possible to get pregnant if you're sexually active. A pregnancy after an ablation is very dangerous for both the mother and the fetus, since the uterine lining would not be able to properly support fetal development. It's very important to talk to your doctor about what birth control you will use after the NovaSure® procedure. WHAT CAN I EXPECT AFTER THE NOVASURE® ENDOMETRIAL ABLATION PROCEDURE? Immediately after the NovaSure® endometrial ablation procedure, some women may experience some cramping, mild pain, nausea, and/or vomiting. Most women feel back to themselves and can resume normal activities within a day or so. Be sure to follow any instructions from your doctor, no matter how good you're feeling. A watery and/or bloody discharge following the NovaSure® endometrial ablation procedure is normal. It could start anywhere from immediately after the procedure to a couple of weeks afterwards. The discharge may last only briefly, or for up to a couple of months. It could even come and go, increasing after certain activities. This is quite normal and can be expected with any endometrial ablation procedure. WHEN WILL I KNOW WHAT MY PERIODS WILL BE LIKE AFTER THE NOVASURE® ENDOMETRIAL ABLATION PROCEDURE? ARE WOMEN WITH HEAVY PERIODS SATISFIED WITH THE NOVASURE PROCEDURE? Yes! In a clinical study, 12 months after the NovaSure® ablation procedure: 95% of patients were satisfied with the results1 97% said they would recommend NovaSure to a friend1 Doctors prefer NovaSure too: Nearly 7 out of every 10 endometrial ablation procedures performed are NovaSure® procedures.